Noman Ali shows how to master the exercise basics and get your fitness on track for the year ahead. Not sure what you need to do to take your fitness to the next level in 2015? Here are the most important things to work on. When it comes to body-shape change, strength training and high-intensity cardio are the indisputable winners. However, for some people, hitting the pavement burns the fat like nothing else. We all know how hard it is to maintain a long-term running program without a specific goal in mind, so look at what fun runs you can enter in your local area. Give yourself at least eight weeks to train and stick to a strict and consistent program. Once you've completed it, why not set your sights on a half-marathon? To get big results you need big exercises such as the dead lift. It targets the hamstrings, gluts, lower back and core. Bending forward gets harder as we get older and back injuries are often due to a lack of skill in this movement. But with a bit of practice, most women can dead lift their own body weight. There's a challenge for 2012. Just remember, it won't happen overnight. Build up the weight slowly once your technique is correct. It's a lot easier to do a push-up that goes halfway to the ground than a push-up that goes all the way to the ground. The weakest part of a push-up is at the bottom and this is therefore the part that needs the most training. This is the case with all exercises: the deeper you go into them, without feeling pain in your joints, the better your gains will be. Keep reminding yourself it's not an exercise unless you have taken it through the full range of motion. You'll really feel it the next day! It may not sound very feminine, but weight training needs to be high up on your list of training focuses for this year. Strength training burns serious amounts of fat and tones your whole body. Squats are the first exercise you should do. Learn to do them perfectly without weight, then add weights as you get stronger. And I'll let you in on a little secret. The vast majority of the amazing-looking real women who grace these workout pages are taking this advice. It really does the job. Old-school weight machines only move your body in one line. Unless you are completing a rehabilitation program, ditch the machines, use free weights or your body weight and train the way you use your body in real life, by adding twists. A controlled twist is dynamite for your core and obliques. Just make sure you do it with control and you don't experience any back pain. Bring on that 2012 toned tummy! In between all this training, book yourself in for some pampering sessions. Having a regular massage is a great way to reward your body for its hard work. A deep-tissue massage also encourages any muscles that are tight or sore from training to relax and release. This is important to prevent injury in the long term. Have a massage once a month. Most people want a tighter tummy but don't know what training is required. Sit-ups and crunches only tone the six-pack muscles; they won't tighten your tummy or reduce girth. For that you need core posture work. Almost every exercise, from squats to push-ups, has a core component. Focus on maintaining your posture during all your exercises and you'll work your core. Add core-specific moves, such as planks and core climbers,and you'll see results. Make sure you don't just work certain parts of your body and neglect others. Here are the tips getting your workout balance right. The sayings "feel the burn" and "no pain no gain" may seem old school, but if you're trying to get a six-pack and you don't feel a serious burn when you work your abs, your chances of success are slim. The abs are inactive, yet sensitive muscles. They are happy for the muscles around them to do the work and they complain when they are called upon. So when you're using them correctly, you'll know all about it. Refine your technique until they burn every time. Salt normally know as sodium chloride (NaCL) and has usually been taken in all kind of foods, doesn't matter what are you making salt is always included in at as a compulsory ingredient. For many years it was said that too much salt is bad for your healthy life, taking too much salt can increase high blood pressure, cause heart diseases, strokes, stomach cancel etc But now a new research about SALT says that they have found that a high-salt diet worsens symptoms in autoimmune diseases such as multiple sclerosis and rheumatoid arthritis. 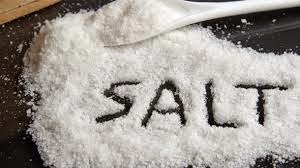 salt linked to autoimmune disease. The autoimmune disease has risen by 5%-7% over the fast 30 years and it can not be explained by genetics. DNA has not changed rapidly. Researchers say that many more explanation likes toxin, smoking,low level of D-vitamin can into occur but none of them provided a appropriate answer. The first clue which defines the link between salt and autoimmune system was came from burger and fries, the researches took 80 subjects over a year and keep researching on them. In order to find how the salt effects they started doing their experiment on rats, an animal version of research and according to them those who ate more salt were four times more likely to develop than those who didn't. After doing some more research they came to know about the fact that those specially smokers use to take more satls likely have double the risk of developing rheumatoid arthritis.